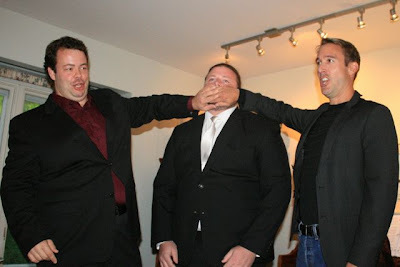 Daniel Webb, Lance Hedlund, and Eric Shaw perform a scene from Die Fledermaus at the pre-show Around the Piano fundraising event. Resident artist and soprano Karen Hughes brings her friends to Sault Ste. 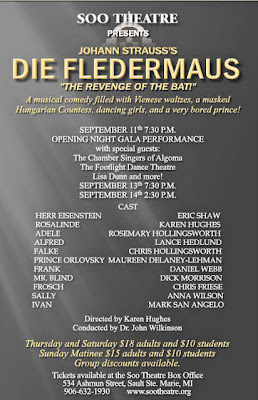 Marie to star in the Soo Theatre Project’s September 11, 13, and 14 production of Die Fledermaus or The Revenge of the Bat. These guest singers will be coming from as far away as Toronto and Omaha, Nebraska. Toronto-based tenor Eric Shaw returns to the Soo Theatre to sing the role of Herr Eisenstein, husband to Rosalinde (Karen Hughes). Shaw performed in the Soo Theatre’s first season, giving his time and superb talents to That’s Amore! in 2006. Shaw was born in Sault Ste. Marie, Michigan, and was raised in Soo, Ontario. Shaw’s aunt and uncle, Phyllis and Dave Bigelow, will be hosting Eric for his time-in-residence as well as hosting a benefit soirée featuring all of the singers. Baritone Daniel Webb comes to us from Knoxville, Tennessee to play the role of Prison Warden Frank. Hughes met Webb this summer in Italy where they performed together in The Marriage of Figaro. Webb played the role of Figaro to Hughes’s Countess. Webb recently performed the role of Colline in Baz Luhrman’s La Bohème on Broadway in over three hundred performances. Guest artist and tenor Lance Hedlund was a graduate school friend of Hughes at the University of Nebraska-Lincoln. Hughes and Hedlund frequently performed the famous love duet from La Bohème at many a venue during their three years in Nebraska. Hedlund, too, made his Italian debut in 2007 in Novafeltria, Italy, singing the role of Edgardo in Donizetti’s Lucia di Lammermoor. Lifelong friends Rosemary and Chris Hollingsworth will return to the Soo Theatre stage for the second time this season, their first appearance in A Grand Night for Singing: Broadway and Opera Favorites! Rosemary will be singing the role of Adèle, the chambermaid of the Eisensteins. Rosemary’s beauty and graceful high notes will be perfect in this charming role. Husband (in real life) Chris will return to sing the role of Falke, the mastermind of the revenge plot on his friend Eisenstein (Eric Shaw). Both Hollingsworths and Hughes attended DePauw University where they earned their degrees in music performance. 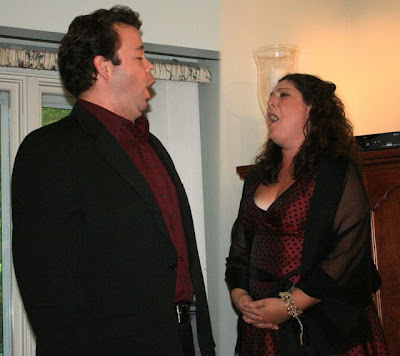 Rosemary and Chris went on to Tri-Cities Opera as resident artists at Binghamton University where they earned their master’s degrees in vocal performance. These friends are not strangers to the Upper Peninsula, as they have visited the Hugheses in Hessel many a summer. 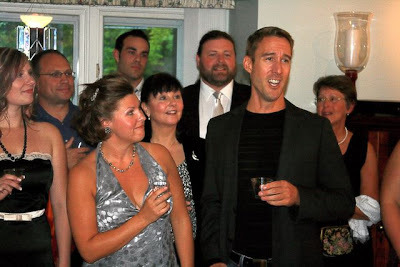 Eric Shaw proposes a toast as Rosemary Hollingsworth and other cast members of Die Fledermaus look on at the pre-show Around the Piano fundraising event. Local favorites who will appear in the show include: Maureen Delaney-Lehman as the bored Prince Orlovsky; Anna Wilson who plays Sally, friend to Adèle, the chambermaid; Chris Friese, recently seen as Lt. Buzz Adams in South Pacific, in the role of Frosch the jailor; and Mark San Angelo, South Pacific’s riveting Luther Billis, in the role of Ivan. The Chamber Singers of Algoma will make up the guest chorus at the ball with Lola Kennedy, Melanie Case, Liz Jacobus, Dianna George, and new resident opera star, Trisha Wells, leading up the stage chorus. On opening night there will be surprise performances during the Act II party scene, including Cedarville’s Lisa Dunn and the men of South Pacific! Daniel Webb and Karen Hughes perform a duet from Die Fledermaus at the pre-show Around the Piano fundraising event. Tickets are available at the Soo Theatre, 534 Ashmun Street, Sault Ste. Marie, Michigan. Thursday, September 11 and Saturday, September 13 at 7:30 p.m. adults $18 and students $10. Matinee Sunday, September 14th at 2:30 p.m. adults $15 and students $10. Contact the Soo Theatre by phone at (906) 632-1930 or by email at sootheatre@lighthouse.net. Our summer 2008 Newsletter is now available online in PDF format (1.3 Mb). 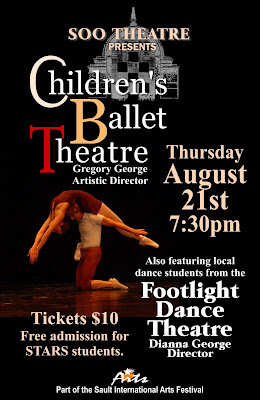 Soo Theatre is glad to welcome back Children’s Ballet Theatre of Lansing, Michigan August 21, 2008 at 7:30 pm. Gregory George, brother of Dianna George, STARS Dance Instructor and founder of Soo Theatre Project, directs this talented company of dancers from the Lower Michigan area. Their mission is to provide a youth-oriented, community-based ballet performance company in Michigan with the highest possible dance, artistic, and performance standards, while fostering a greater appreciation of ballet as an art form. For 25 years, CBT has thrilled mid-Michigan audiences with the talent and exuberance of its young dancers. Its annual Nutcracker during Thanksgiving weekend at the Wharton Center has turned this much-loved holiday classic into a can’t-miss local tradition. In addition to Nutcracker, the company performs classic ballets such as Sleeping Beauty and Cinderella, in the annual spring show. They will be performing pieces from earlier shows, solo pieces, ensemble pieces, and our own STARS dance students will perform with the Children’s Ballet Theatre. “We are so excited to dance with Mr. George’s group. This is a wonderful opportunity for the Soo Theatre and STARS”, said Footlights Dance Theatre member Elizabeth Jacobus of Rudyard. Come one, come all, Thursday, August 21, 2008 at 7:30 pm at the Soo Theatre Project on 534 Ashmun St. Tickets are $10 and free admission for STARS students. Any questions please call (906) 632-1930 and/or email us at www.sootheatre.org. Soo Theatre Project presents Cedarville native Mia Johnson. Mia is originally from Cedarville but calls Philadelphia, Pennsylvania her home as well. Mia is a singer-songwriter-guitarist; a triple threat in her own way. She began playing and writing whilst in Cedarville, eventually relocating to Philly where her music began to flourish along with her talents. She began performing anywhere that would allow, beginning on the street, since she was not of age to perform in bars. Not long after she was playing full gigs in café houses, bars, and anywhere she could. Mia has a melody-led, rhythm-driven, acoustic rock fleshed out by clever lyrics, solid vocals, and ingenious instrumentation. She combines this with a full rock rhythm section of cello, acoustic guitar, and electric guitars. 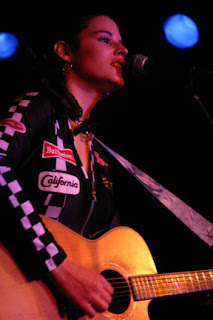 Her sound has been compared with artists such as Ani DiFranco, Alanis Morissette, and Janis Joplin. Mia will be joined on stage by cellist and Philly native Erin Ryan. Erin never stays in one spot for too long; she performs with Mia Johnson, The Good Problems, local Philly bands, and is an active studio musician. Mia Johnson and cellist Erin Ryan will be performing at the Soo Theatre Project on Friday, August 22, 2008 at 8 p.m. Tickets are available at the Soo Theatre Project lobby and will be sold at the door an hour before the show. Summer hours are Monday - Thursday 10 – 6 and Friday 10 – 5. Tickets are $10 for adults and $8 for students of STARS, Grooves, and Steve's Music. Come and enjoy this unique duo!!! South Pacific To Open August 7; Get Your Tickets Now! Lise White, a well-known local singer throughout the Eastern Upper Peninsula and Soo, Ontario is a multi-talented singer-actress that brings a rarely-seen spunkiness to the character Nellie Forbush. Her comedic timing and solid vocals polish her character to perfection. Tom Lehman portraying the local Frenchman Emile de Becque has an ease on stage that is very apparent. Tom has been performing for years and gives Emile a natural, easygoing personality that attracts the eyes and melts the heart. Tom has a natural ease portraying Emile, he gives him a relatable persona. Audiences will fall in love with these two very different yet complimentary leads. 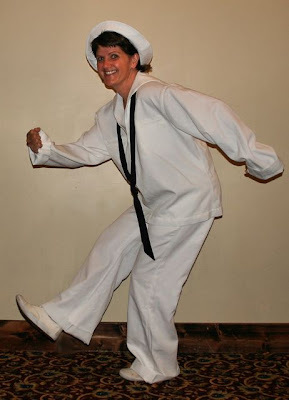 Nellie Forbush is a naive U.S. Navy nurse from Arkansas who falls in love with Frenchman Emile de Becque. Although their love is strong, Nellie is still fickle and afraid to commit to Emile, who wants to spend the rest of his life with Nellie. Her feelings for Emile run hot and cold, but the audience knows they are meant for each other…let's hope. 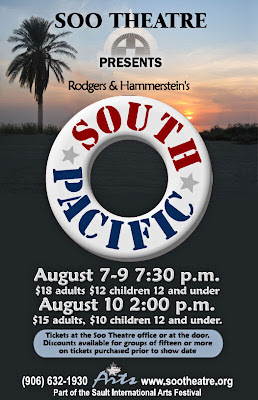 See South Pacific at Soo Theatre Project to find out the juicy details, touching moments, famous songs, and comedic interludes. All local talent headlines this adaptation of Roger's and Hammerstein's South Pacific. Love, laughs, singing, and dancing are just a couple of words to describe this great production. You will be on the edge of your seat with laughter at Luther Billis's (Mark San Angelo) and Nellie Forbush's (Lise White) "Honey Bun," then pulled back when you see the love between Nellie Forbush and Emile de Becque with "Some Enchanted Evening." Bloody Mary (Lisa Dunn) will grab you with her famous song "Bali Ha'i" and then send you for a loop with her adaptation of the English language. Lt. Joseph Cable (Joseph Kargiannakis) is a courageous young Marine, he sings "Younger than Springtime" making his intentions known to the South Pacific native Liat (Mary Witucki). Only a week left until this Tony Award-winning musical is performed on the Soo Theatre Project's stage, get tickets now. Tickets are available at the door and/or at the Soo Theatre Project lobby located on 534 Ashmun Street, Sault Ste. Marie, MI. Soo Theatre Project lobby hours are Monday through Thursday from 10 a.m. to 6 p.m. and Friday from 10 a.m. to 5 p.m. The performances are Thursday, Friday, and Saturday evenings, August 7, 8, and 9 at 7:30 p.m. with tickets at $18 for adults and $12 for children 12 and under. In addition, a Sunday matinee on August 10 will start at 2:00 p.m. with tickets at $15 for adults and $10 for children 12 and under.